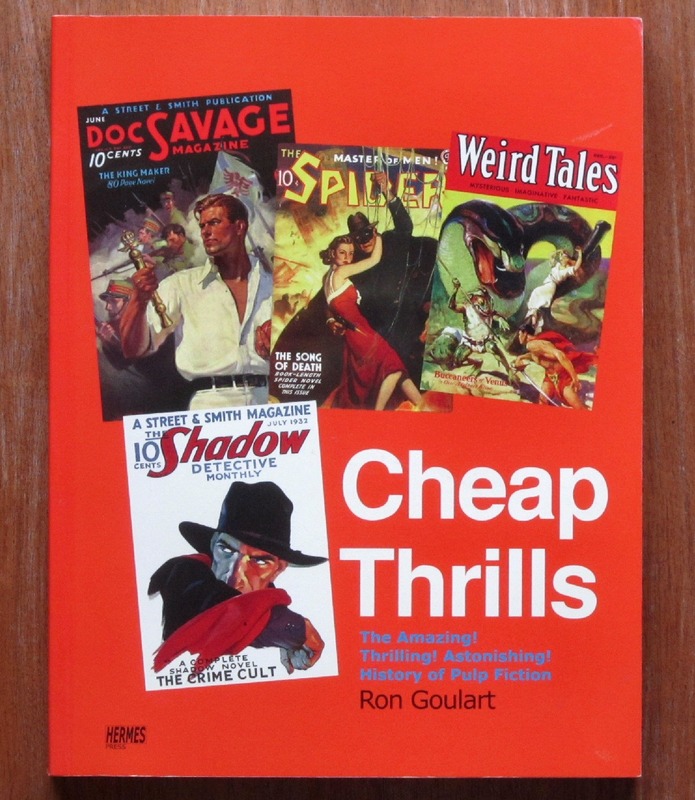 If you’ve come across the name Ron Goulart the chances are it was as a historian of 20th century popular culture – comics and pulp magazines in particular. But Goulart was a poacher as well as a gamekeeper, churning out over a hundred short and easy-to-read novels of his own (the small selection that I’ve read so far is shown above). 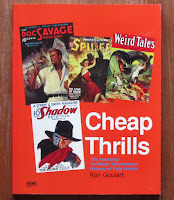 One of his best-known non-fiction books is called Cheap Thrills (pictured below) – and the same phrase sums up his fiction too! 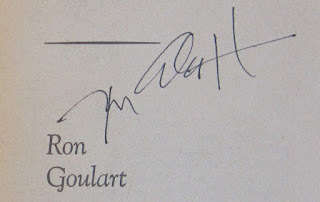 Ron Goulart was born at the height of the pulp era in 1933, and began his full-time writing career in the 1960s. His novels are an intriguing blend of the straightforward plots and larger-than-life characters of the thirties with a satirical take on the consumerism and hippie zeitgeist of the sixties. As far as I know he’s still alive, and I hope he won’t be too offended if I describe him as the late 20th century equivalent of a pulp magazine hack. His novels are all very short – typically 40 to 50,000 words – and were clearly written with the aim of meeting deadlines rather than getting onto award shortlists. All of them came out as paperback originals, and very few of them ever saw a second edition. Inevitably, the quality is variable – some of the ones I’ve read are pretty dire, but others are really very good. 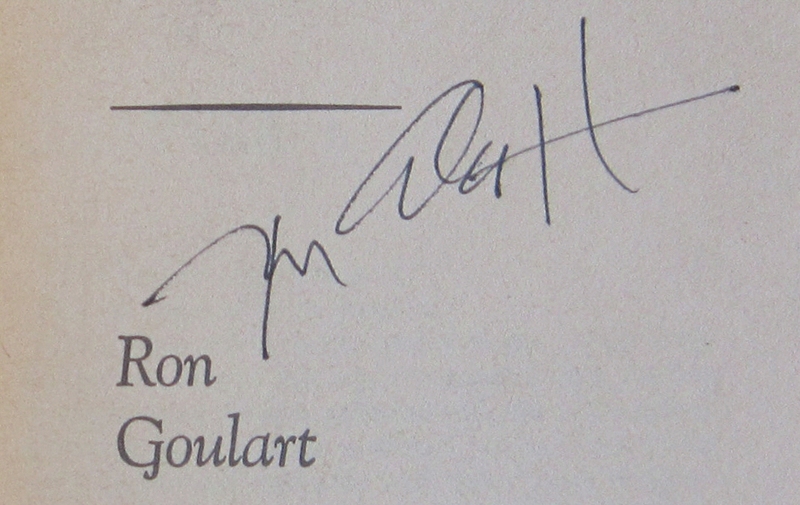 A couple of years ago I wrote a long post about Goulart’s 1979 novel Hello Lemuria Hello. This is still by far my favourite of the ones I’ve read, both for its fortean themes and its “superhero” style protagonist – Jake Conger of the Wild Talents Division. I subsequently tracked down two other Jake Conger novels – A Talent for the Invisible (1973) and The Panchronicon Plot (1977). They’re both enjoyable, especially the latter, although much less fortean. The same is true of a couple of other offbeat “near future” (actually 2002) adventures I’ve read – Calling Dr. Patchwork (1978) and Hail Hibbler (1980) – which feature a husband-and-wife team of private investigators called Jake and Hildy Pace (Goulart seems to like the name “Jake” for protagonists – there is also Jake Cardigan in Tek War, which he ghost-wrote for William Shatner in 1989). I also enjoyed the three Vampirella adaptations I read (he wrote six in all, but I’ve only got the ones that were reprinted in the UK). After Hello Lemuria Hello, these are probably the most fortean-themed of his novels that I’ve read. He’s also done a couple of other comic-book adaptations – Challengers of the Unknown (1977) and a Hulk novel called Stalker from the Stars (also 1977, co-written with Len Wein and Marv Wolfman under the pseudonym of Joseph Silva). I still need to track those down – along with Goulart’s novelization of that archetypally fortean movie, Capricorn One. 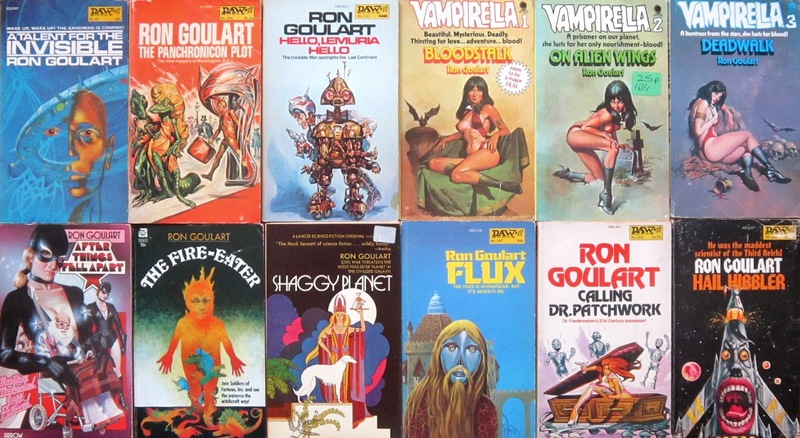 All the Goulart novels I’ve read (except the Vampirella adaptations) have the same basic plot. They start with the protagonist(s) reluctantly accepting an assignment to track down some nefarious criminal or criminals. They’re given an initial lead, which in due course puts them onto a second lead, and so on through half a dozen wacky and often outright comical scenes until the final showdown. This is a perfectly good plot structure, as long as the hero is constantly racing against the clock, falling into traps, getting double-crossed, chasing after red herrings, etc, etc. In Goulart’s best novels, that’s exactly what happens ... but in some of the others he forgets to do this, and the protagonist sails through the story with no real obstacles to overcome. The result in these cases is inevitably dull, no matter how original and imaginative the incidental details are. I’ve been looking for a pattern, to give me a better idea what to look out for in future. Based on my experience so far, the novels that involve series characters (either Goulart’s own creations or franchise characters) and are set here on Earth are all pretty good. Novels set in Goulart’s fictitious Barnum system (of which I’ve read three – The Fire-Eater, Shaggy Planet and Flux) were rather dull and forgettable in my opinion – as was the one that was set on Earth with a non-recurring protagonist (After Things Fell Apart). I suspect in reality it’s not as clear-cut as this, and – as with 1930s pulp fiction – you just have to accept that some of the novels are good and some are bad.